Hamam is a brand that has consistently stood by its promise of honesty and safety for the last 87 years. Hamam harnesses the best of nature to provide safety and protection to your skin, and that's why Hamam has stood the test of time as a component of the wisdom mothers’ pass on to their children to keep them safe. New Best-Ever Hamam does not merely cleanse your skin, it purifies it. It harnesses one of nature's most potent protectors in 100% Pure Neem Oil and complements it with two of nature's most effective caregivers in Tulsi and Aloe Vera to bring together a best solution to fight your skin's battles against dust, sweat and pollution. New Best Ever Hamam promises you a bath that will evoke the best of nature.#GoSafeOutside with the New Best Ever Hamam Skin Protection. #GoSafeOutside with the New Best Ever Hamam Fragrance. Brought to you in a sleek modern pack at an attractive price, Hamam aims to be your companion of choice as you get ready to step out to take on the challenges of the outside world. So, what are you waiting for? Try the New Best Ever Hamam and #GoSafeOutside! Explore the entire range of Soaps available on Nykaa. 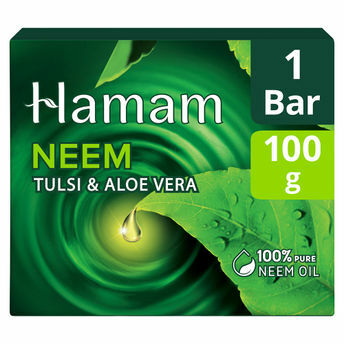 Shop more Hamam products here.You can browse through the complete world of Hamam Soaps .Alternatively, you can also find many more products from the Hamam Neem Tulsi And Aloevera Soap Bar range.